Inspiration for manipulators, dancers and jugglers. Simply amazing work by our friend Tommaso Panagrosso. We’ve already post his act, but this clip is really better. One ball can be a world. Thank you Tommaso for showing us how deep it could be. Okay, so it’s not really manipulation, but it is intensely amazing. I was awed by the tree at the start, and then it just kept going. Impressive French installation graffiti art. 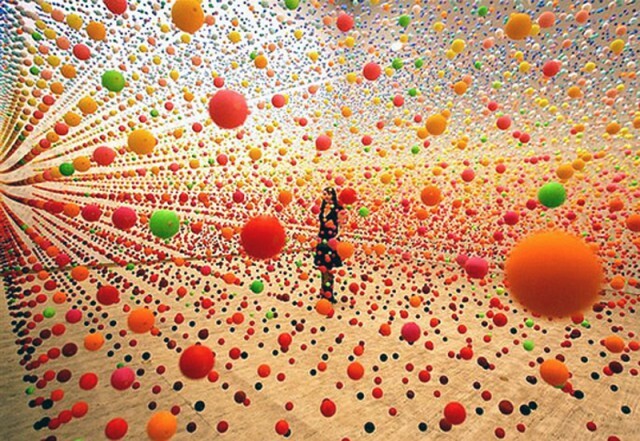 Atomic: Full of Love, Full of Wonder was a ball installation in 2005 by artist Nike Savvas at the Australian Centre for Contemporary Art in Melbourne. Her pentagonal string sculptures are also fantastic. via Colossal which has more photos.